Couldn’t make it to the conference? Watch it here. Crystal Bridges partnered with the University of Nebraska-Lincoln’s National Center for Research on Rural Education to conduct an extensive literature review of museums and distance learning. You can access the literature review here – click on the links to download the pdfs. Earlier this summer, thanks to a generous grant from the Windgate Charitable Foundation, Crystal Bridges Museum of American Art hosted art museums and organizations from throughout the country to talk about the distance learning. The meeting was designed to paint a picture of the current landscape of distance learning and art museums, as well as envision the future. Crystal Bridges has organized an online event to share the results of this meeting with the wider art museum community. Hosted by Museum-Ed, participants will learn about an array of approaches to distance learning and have the opportunity to ask questions and get answers from art museum distance learning pros. Learn about a comprehensive literature review conducted by researchers at the University of Nebraska to examine the historical roots of distance learning, current practice, and implications for the future. 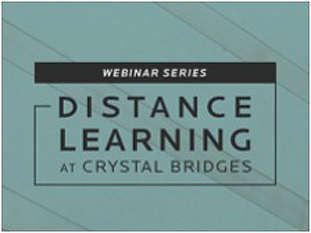 This research was done to help inform Crystal Bridges as it develops a distance learning initiative, but the information is pertinent to art museums throughout the country. The research will be available in a new website about distance learning and art museums. How can staff and visitors collaborate using online technologies to deepen and expand encounters with the museum? What are some of the potential rewards and challenges of online collaboration? Hear past examples and current questions from the Metropolitan Museum of Art. During its ten-year history, the videoconferencing program at the Amon Carter has gradually moved out of the studio and into the museum galleries. This case study considers the benefits and challenges of delivering interactive videoconferences using wireless mobile technology to facilitate viewing and discussing original works as seen on the wall. Other Amon Carter strategies for making the content relevant and engaging for school and adult audiences will also be introduced. The North Carolina Museum of Art will present its partnership with the North Carolina Virtual Public School to create five online, semester-long courses for high school students. Educators will share experiences incorporating multiple perspectives throughout the collaboration. Several more millions of visitors from all over the world visit the website of The Museum of Modern Art, NY than enter its galleries every year. How can MoMA help web-based visitors connect with modern and contemporary art in substantial and engaging ways? For the past three years MoMA has offered a growing number of opportunities for online courses, including its first MOOC offered in late July of this year. This session will explore what it is like to teach over 15,000 students from throughout the world in one class. Art21, a nonprofit contemporary art organization, is entering the fifth installment of its year-long professional development initiative, Art21 Educators. We are reflecting on the distance learning techniques utilized throughout the program, and we look forward to how the first five years will inform future years of the program. This case study represents the perspectives of both the institution and a participating educator. The University of Arkansas has been utilizing the power of the Unity game engine to enable students to recreate sites such as Pompeii to create a virtual, online lab for art historical research. Explore how this game engine can create immersive three-dimensional spaces for learning and recreate art historical sites such as the original exhibition of Church’s The Heart of the Andes at the 10th Street Studio in May, 1859. 2 Responses to "Art Museums and Distance Learning Online Event"
This was a wonderful compilation of many different experiences, approaches, and lessons learned from presenters on Distance Learning in the Art Museum. This is particularly helpful for our institution as we are beginning to explore the opportunities and challenges that distance learning integration brings for the art learner. Thank you. I would like to know where I can get the white paper that Crystal Bridges have written on the subject and as indicated in the Summit would be provided. Thanks! Carolina and All, the white paper written by Crystal Bridges and their university partners will be published on http://distancelearning.crystalbridges.org October 22, 2013. Also on this site you can soon find recordings of the Webinar Museum-Ed hosted called Distance Learning and Art Museums.